Many of you reading this today are probably located in TDS’ home state of Wisconsin. The list of bands from this state to make it big is short and you could probably count them on one hand. Although it’s rare, today’s band is one of them – and while it may have happened in an unusual fashion, it happened, and the music world is better off for it. Way back in 1980, a few guys were looking to start a band in the Milwaukee, Wisconsin area. Bassist Brian Ritchie and drummer Victor DeLorenzo decided to make a band after lamenting the fall of American punk rock. 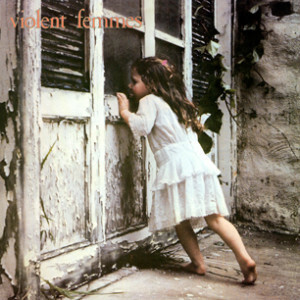 Ritchie came up with the name Violent Femmes as a fake name when being questioned about what the band was about and who was in it. They liked it so much, it stuck. While the desire to fill a punk-less gap in music was strong, they couldn’t do it without a singer. They found Gordon Gano for vocals and started playing coffee houses and street corners. They were playing in front of Milwaukee’s Oriental Theatre in August of 1981 when they caught the eye and ears of James Scott, guitarist for The Pretenders, Instead of playing outside the Oriental, they had the stage that night as an opener. The rest is history. Today we focus on their debut eponymous album that was released in April of 1983. It was recorded at Castle Studios in Lake Geneva, Wis. in July of 1982. Most of the album was written by Gano while he was still attending high school in Oak Creek. The album struggled off the shelves initially, with low sales and not a ton of buzz. Fast forward four years later, and the album had the unique feat of achieving gold status without having made an appearance on the Billboard 200. Eight years after release, the album would be certified platinum in the states. It would eventually hit the Billboard Chart in 1991, peaking at #171. Little or new critical reviews came upon release, but modern reviews have given this record nothing but praise. Compelled by their tribute to punk rock, but also having a real alt-rock feel well before the Seattle scene brought it to light. Obviously I’m going to be somewhat of a homer for this record, as they’re from my home state and very close to where I grew up—but even had that not been the case, it’s a really great album. My top three tracks below are staples in my music rotation. Gano’s vocals are unmistakable in an era when all the hair metal acts sounded virtually the same. They have this great blend of punk rock angst combined with some super-poppy guitar riffs and drum work. You don’t know whether to rebel against the man or clap along happily to this one—and it’s a really fun listen. Admittedly, I can’t say that I’ve listened too much from the Femmes after this release, but maybe this one is all you need. It’s pretty darn great. My guess is even a casual music fan will have heard a couple songs from this album through movies, TV, or commercials. Give the whole thing a shot today for $5 bucks, I think you’ll come away delighted. What a good way to start the new year!